Alfa Romeo made their name in the 1930s and 1940s making hand-built, exclusive, bespoke sporting cars for wealthy clientele. Eight decades later they revisited this genre with the 8c Competizione. 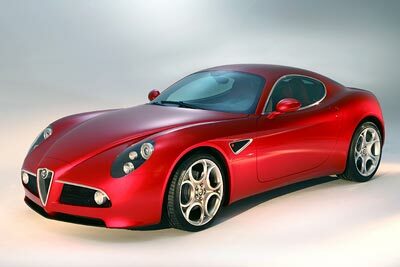 With bodywork made from carbon fibre and design elements that pay tribute to past Alfa Romeo greats. 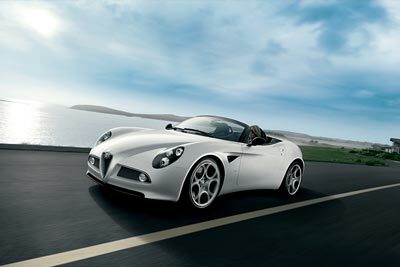 Alfa made just 500 8c Competizione two seat coupe’s between 2007 and 2009 and 500 8c Spider 2 seat convertibles between 2009 and 2010 (the car was built at the Maserati factory, with the engine made by Ferrari). Mounted longitudinally in the front of the 8c Competizione is a 4.7 litre V8, producing over 400 bhp (at 7000rpm). This drives the rear wheels through a 6-speed computerised-manual transmission. The 0-62 mph dash takes just 4.5 seconds, while the top speed was listed as over 180mph. The six speed transmission is mounted at the rear of the car for better weight distribution. Any one of five different gearbox modes, from full automatic to manual-sport, could be selected. In the most aggressive setting, manual-sport, the time taken to change between gears was an incredible 175 milliseconds. Alfa Romeo 8c Competizione – Image copyright line © 2014 Fiat Chrysler Automobiles N.V.
Alfa Romeo 8c Competizione Spider – Image copyright line © 2014 Fiat Chrysler Automobiles N.V.